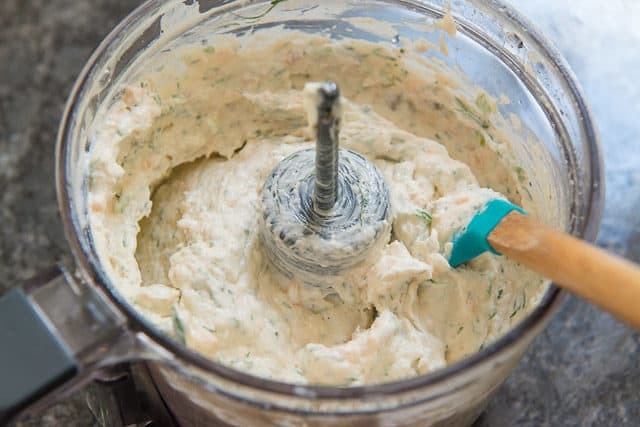 This Smoked Salmon Spread is creamy and delicious, with a smoky flavor and saltiness from smoked salmon, and lots of fresh dill. It’s perfect for entertaining, and only takes 5 minutes to make! 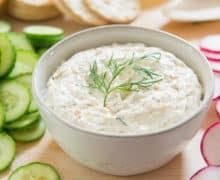 Whenever I host a party or get-together, smoked salmon always makes an appearance in some form, and this creamy salmon spread is one of my favorite appetizers. If I’m feeling up for the prep, Smoked Salmon Deviled Eggs are my favorite thing to serve because people go gaga over them, but deviled eggs can be a bit tedious to make. And I’m almost always making several things for entertaining, so I need to limit the prep-heavy foods. That’s where this recipe comes in. It only takes about 5 minutes to make, it can be made a day ahead, and it feels so much like party food. 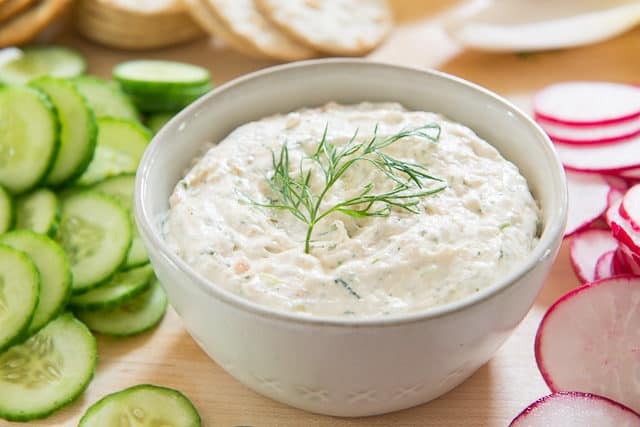 The smoked salmon is definitely the star flavor, but you get brightness from fresh lemon, the classic complimentary herb flavor from fresh dill, a little bite from fresh scallions, and creaminess that comes mostly from cream cheese, with a touch of Greek yogurt and sour cream for tang. It’s a flavor powerhouse. 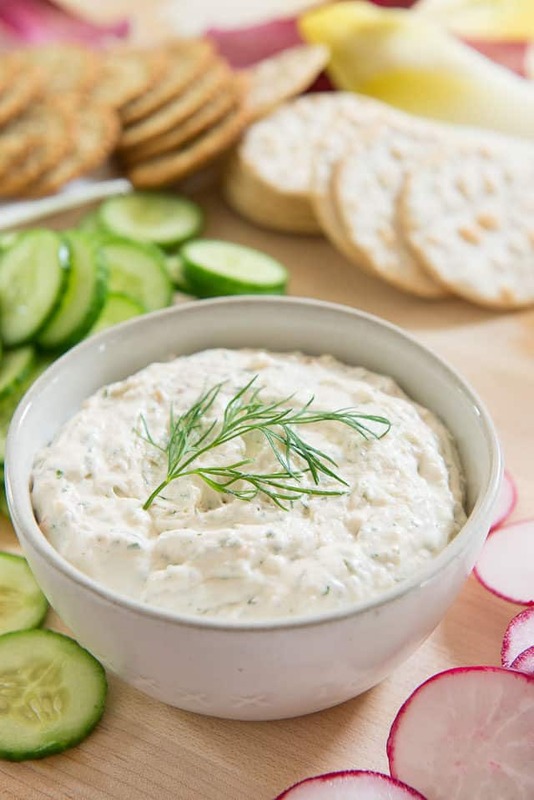 As you can see with the cracker above, this is definitely more of a spread than a dip, but if you wanted to, you could definitely thin this recipe out for a more dip-like consistency. Both sour cream and buttermilk are great options for that. I don’t usually add salt because of all the salt in the smoked salmon. Put the lid on and blend it all together, until smooth. I like to stop when there are no longer any big chunks of smoked salmon, but you can still see little bits of orange and green, showing the salmon and fresh dill. Use a spatula to scrape the smoked salmon spread into a bowl for serving, or if you’re making it ahead, into a storage container up to 1 day in advance. I recommend a mix of fresh sliced bread, fancy crackers, sliced cucumbers, sliced radishes, and even endive cups. That way you have a good mix of fresh vegetables that anyone eating grain-free can enjoy, but of course, eating this spread with crackers or crostini is more traditional. This Salmon Salad is also a delicious dish to serve with crackers for a party, or to pack on a picnic. Enjoy! 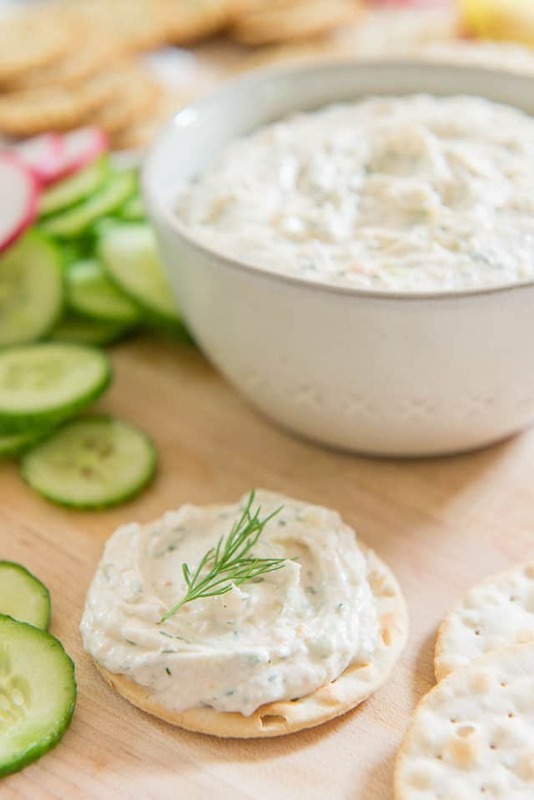 This Smoked Salmon Spread is creamy and delicious, with a smoky flavor and saltiness from smoked salmon, and lots of fresh dill. 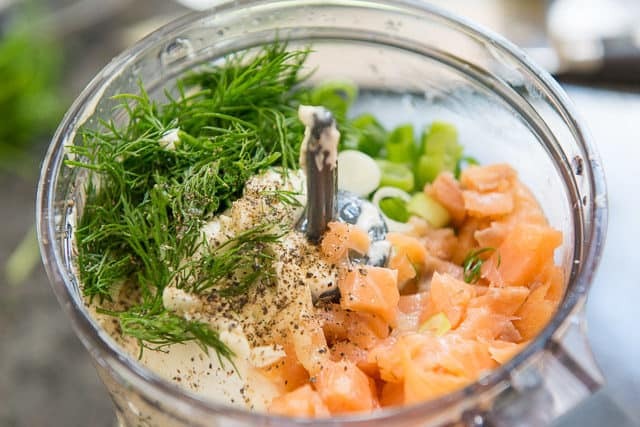 Place the cream cheese, smoked salmon, sour cream, greek yogurt, scallion, lemon juice, garlic, dill, and black pepper in a food processor. Taste the mixture and add salt if you’d like (I didn’t add any, since the smoked salmon is fairly salty). Serve with crackers or crostini. Enjoy! This recipe may be made up to 1 day ahead. Store in the refrigerator until ready to serve. Post updated with new photos, writing, and tips in July 2018. Originally published July 2013. Joanne, You have described the pleasures and pain of blogging very accurately. Those of us who are in it for the long haul must feel deep passion for the food we love and for the readers we hope to reach. Let’s not forget that we love connecting with fellow bloggers, too. ONWARD! Three cheers to that, Liz! I ask myself at least once a day, what on earth am I doing?? Sometimes all I can think is, I have no idea, probably making a huge mistake! Other days I think I’m just forging along, trying to make something of a dream. It’s frightening and sometimes I really wonder if I have lost my mind and think that in the shadows of such great bloggers, maybe I should bow out now. But I keep going because I know deep down that if I don’t give it all I’ve got, I’ll never forgive myself. You’re so inspiring Joanne, thank you for all you do and all you are!! Hi Tiffany, I completely understand what you are saying. One thing that Sheryl Sandberg says is that sometimes we are our own worst enemies, and I think often that is true. I think it is great to practice having faith in yourself and what you’re doing, because if you love it, that’s what truly matters. My family still thinks I’m crazy. Although I still do my in-home culinary classes but they don’t understand why I spend so much time on this. 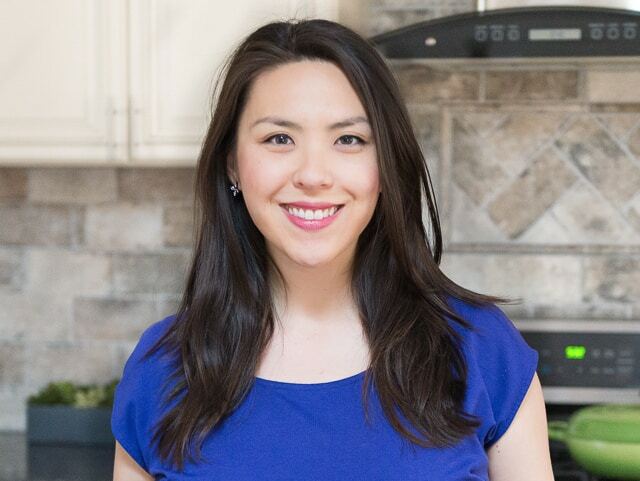 I find that my culinary classes and blog compliment each other. I’ve also found that all my clients now find me from my blog. I use to advertise my business in the local papers sometimes paying quite a bit. Then when people would contact me about classes and I asked how they heard about me, it was always from my blog or searching online. Blogging becomes a part of your life, almost an obsession that I do have to pull myself away from at times. Do you feel that way as well Joanne? I’m happy to hear that the blog helps bring you clients! It is clear that you love what you do, and that’s so important. Joanne I am always thrilled to see you reveal more of yourself here. It gives the rest of us hope we can follow our own dreams and be successful. You know you’ve been my guru as well as my friend. I am so happy you didn’t give in to your fears and am incredibly proud of you. So glad you came away from blogher inspired.